10 million people smoke in the UK however although it is commonly acknowledged that smoking is bad for your health many people do not know the extent of damage with the UK society of Psychiatrists describing it as the “the biggest and most avoidable cause of death in the UK.” As 100,000 people die from smoking every year in the UK. Futhermore smoking is costly for the individual and society a someone who smokes in the UK spends on average £3000 a year on cigarettes and smoking is estimated to cost the NHS £2 billion a year. Although smoking has generally declined among the population in recent years there has been an increased interest in Electronic cigarettes among the younger generation. With the amount of young people vaping doubling between 2011 and 2012 in the US. Although manufacturers have been criticised for trying to encourage younger people to smoke by adding a variety of different flavours to their products such as grape, lime and orange to name a few the health effects of vaping are described by the NHS website as being “only a fraction” of the risk of cigarettes. Electronic cigarettes do not contain tar or carbon monoxide. Nevertheless, the vapour still contains propylene glycol, glycerin, water, nicotine, flavourings and potentially toxic carbonyls. Smoking increases the likelihood of developing many different types of cancer with one of three cancer related death linked to smoking. Theese includes Kidney, Stomach, Mouth and Lungs. This is due to cigarettes containing over 70 cariogenic ingredients which damage DNA and lead to mutation and growth which can result in cancer. Lung cancer is strongly related with smoking with nine out of ten lung cancers being attributed to smoking. Smoking also affects the lungs by it causes 84% of deaths from obstructive pulmonary disease. The risk of developing kidney cancer from smoking is great as the more cigarettes smoked the greater the risk as the risk of developing cancer is doubled if smoke twenty cigarettes a day compared to ten. Nevertheless, this risk can be reduced if smoking is stopped. In five years smokers who stop completely half this risk of cancer and after twenty years the risk of head and neck cancer is the same as non-smokers. Heart related conditions are also strongly related to smoking as the tar and nicotine in cigarettes thickens blood and increases blood pressure increasing the risk of damage to artery walls and blood clotting which can lead to atherosclerosis. Atherosclerosis is a self-perpetuating cycle where clots form in the arteries reducing blood flow to organs and can cause heart attacks and strokes and organ failure. The carbon monoxide in cigarettes makes the heart work faster which also contributes to atherosclerosis. Carbon monoxide also reduces the amount of oxygenated blood in the body by displacing oxygen by binding to haemoglobin to form carboxyhaemoglobin.to bind to oxygen. Therefore, there is less oxygen available for organs which can result in organ failure. Similarly, to cancer the risk of CHD other heart related conditions increases with the amount of cigarettes consumed and reduces if smoking stops as after one year of not smoking the risk is reduced by half. Other physical conditions associated with smoking include reduced fertility in men and women as the fertility of women who smoke is only 72% of women who don’t smoke. As smoking can affect egg production, fertilization and growth of the baby. Futhermore the sperm count of men who smoke is significantly reduced as smoking can cause less motile sperm, a smaller amount of sperm and sperm that is abnormally shaped. Long term smoking can cause further health effects that interfere with the smokers quality of life these include chronic bronchitis and persistent coughing as well as threatening conditions such as emphysema and chronic obstructive pulmonary disease. As well having physical effect smoking can also result in mental health problems as there has been shown to be a link between smoking and the onset of anxiety and depression. Also, Nicotine withdrawal from people trying to stop smoking can worsen depression. Futhermore smoking is also associated with increased risk of dementia. As four studies by the royal college of physicians with an overall sample size of almost 10,000 found a positive correlation between smoking and dementia. Many of the treatments for stopping smoking can be obtained through visiting your GP and the NHS stop service. Theese treatments include Nicotine replacement therapy which can be in the form of skin patches, chewing gum, inhalants, tablets and nasal or mouth spray. 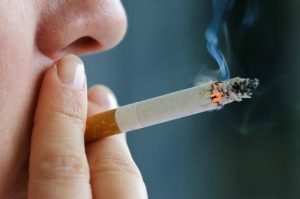 Theese act in different ways as patches slowly diffuse nicotine into the blood stream whereas chewing gum and nasal and mouth sprays work instantly although the NHS advise using more than one method at the same time for the best results. A GP can also prescribe drugs such as Varenicline and Bupropion to help with Nicotine craving.